Depiction, Inc. today announced a slate of activities in support of National Preparedness Month, including webinars, a live community virtual drill, and a new preparedness add-on pack product, available free during September. 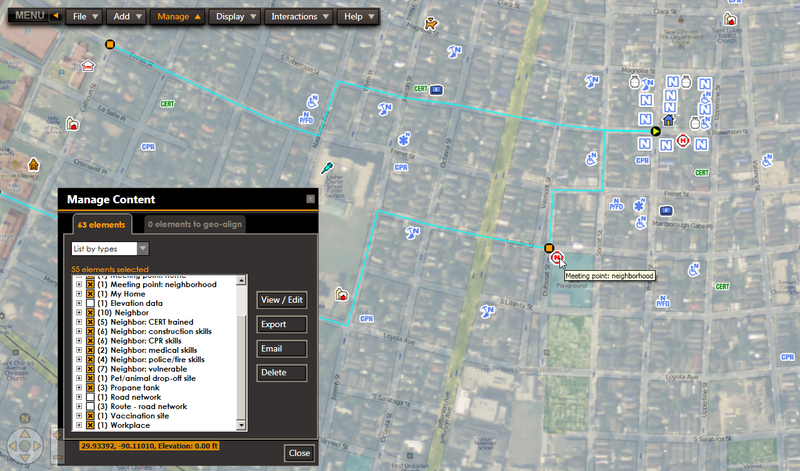 The add-on pack extends the company's Depiction® mapping and simulation software, which lets users easily create interactive visual stories or "depictions" about their community--from "what-if the flood reaches this high?" to "how would I get to my family if this bridge is destroyed?" Be Informed: The new Quickstart data sources in the Preparedness Add-On Pack show users the natural hazards in their area. what-if the flood reaches this high? "The Preparedness Add-On is really the centerpiece of our efforts as a National Preparedness coalition member," said Depiction CEO Mike Geertsen. "This new extension makes it even easier for communities and individuals to explore scenarios in their area - choosing neighborhood gathering points or reviewing occurrences of earthquakes or hurricanes in their region, for example"
"Get a kit": The add-on provides a new Depiction map element, the Emergency Kit, which includes a checklist of the items recommended by the Ready campaign, allowing families to keep track of both the location of their kit and its contents as part of a depiction of their neighborhood. "Make a plan": More new elements, representing meeting places, utility shut-offs, vulnerable neighbors and more make it easy for families and neighborhoods to make detailed plans of what to do and how to communicate in an emergency, and Depiction's powerful but simple simulation tools allow users to easily make changes to the plan in response to events, such as blocked roads or flooded buildings. "Be informed": New Quickstart data sources, such as historical hurricane tracks and earthquake data, enable users to quickly get information about natural hazards in their region that they should be preparing for. During September, the Preparedness Add-On Pack will be available for free at http://www.depiction.com/npm. 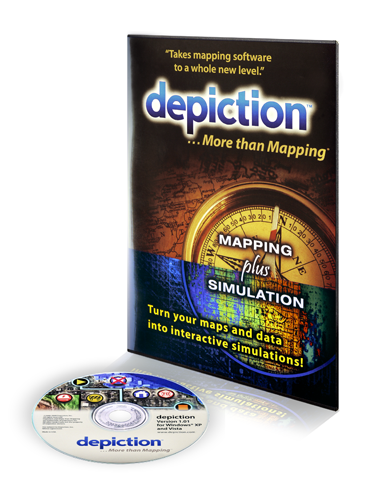 September 24, Depiction, Inc. will use the add-on pack in a community virtual drill in Everett, Washington. Working with the Everett Department of Emergency Management, the city's Office of Neighborhoods, and the Snohomish County Red Cross chapter, Depiction staff and community members will engage in simulated disaster planning and response for a real neighborhood using Depiction. "Brochures and lectures only go so far in helping citizens prepare," notes Mary Schoenfeldt, with the city's emergency management department. "We're excited to prototype a new type of interactive community event that might even make becoming prepared fun!" The event will start at 7 PM on September 24 at the Snohomish County Red Cross Headquarters at 2530 Lombard Avenue in Everett. Depiction, Inc. will be hosting two other events during National Preparedness Month. Today, September 16, at 10 AM PDT/1 PM EDT, the company will host a webinar exclusively for Red Cross staff and volunteers, "Red Cross Disaster Planning & Response." The webinar will help Red Cross workers make the most of Depiction's mapping and simulation tools in their work preparing for and responding to disaster. Red Cross staff members or volunteers can still register to attend at http://www.depiction.com/webinars/redcross. "Red Cross chapters have been among the earliest adopters of Depiction," said Geertsen, "and we want to do everything we can to continue to support them in their life-saving work." On September 30, Depiction, Inc. will host another webinar, "Depicting Disaster: Helping Communities and Businesses Prepare." Open to emergency managers, business continuity professionals, first responders, volunteers and anyone involved in helping others prepare for emergencies, the webinar will demonstrate how Depiction can be used as a tool, not only in disaster preparation and response, but also as a tool to help citizens and employees better visualize and understand potential dangers and emergency plans. Register at http://www.depiction.com/npm. To help citizens understand the power of visualizing specific scenarios in their community, Kim Buike, retired US Navy Captain, Red Cross Volunteer and the host of each of the Depiction National Preparedness Month webinars, has created a short video example using Depiction to show the risk to towns south of Seattle, WA from the damaged and leaking Howard Hanson Dam. National Preparedness Month is sponsored by FEMA's "Ready" Campaign and Citizen Corps. Held each September, it is designed to encourage Americans to take simple steps to prepare for emergencies and disasters in their homes, businesses and communities. 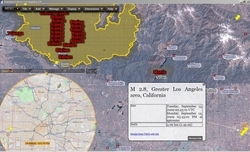 Depiction, Inc. is the creator of Depiction--affordable, easy mapping and simulation software that is being used around the world by local governments, federal agencies, volunteer organizations, corporations and private individuals to turn maps and data into interactive simulations. Designed to be a flexible platform, Depiction can be extended by its users, computer programmers and industry consultants who can create, share and sell their own "what-if" add-ons. Depiction is a National Preparedness Month Coalition MemberDepiction mapping and simulation software logo Depiction can help communities, businesses and families prepare for disaster.Depiction Mapping & Simulation Software Get a Kit: The new Preparedness Add-On Pack helps keep track of the contents of an emergency kit.A screenshot demonstrating the 'emergency kit' map element from the new Preparedness Add-On Pack. 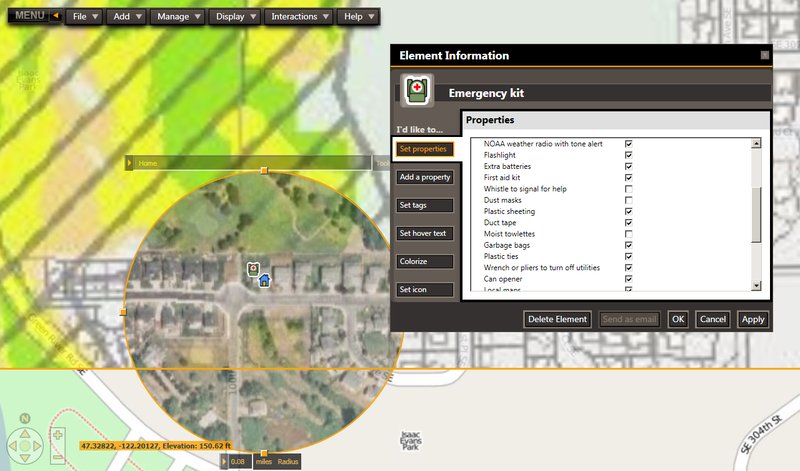 Make a Plan: The Preparedness Add-On Pack contains more than 30 map elements that communities and families can use to plan for disaster.This screenshot demonstrates how the new elements in the Preparedness Add-On Pack can be used to make emergency plans.